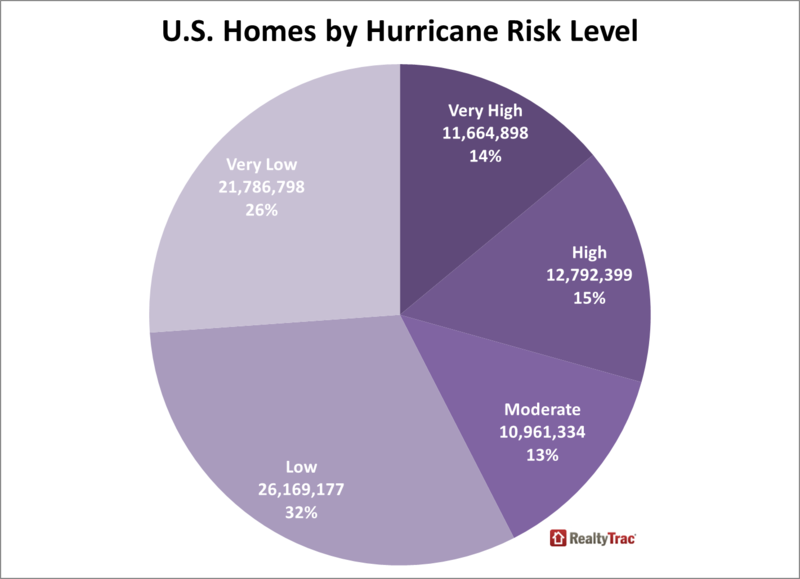 IRVINE, Calif. – Sept. 3, 2015 — RealtyTrac® (www.realtytrac.com), the nation’s leading source for comprehensive housing data, today released its 2015 U.S. Natural Disaster Housing Risk Report, which found that 35.8 million U.S. single family homes and condos with a combined estimated market value of $6.6 trillion are in counties with high or very high natural hazard risk. Those 35.8 million homes represent 43 percent of the 83.4 million single family homes and condos in all counties analyzed for the report. For the report RealtyTrac assigned a natural disaster risk score to 2,318 counties nationwide with sufficient home value data available. Based on its score, each county was assigned to one of five risk categories for overall risk of natural disaster: Very High, High, Moderate, Low and Very Low. Similar scoring and ranking was also used to rate risk for each of the five natural disasters individually (see full methodology below). “In the interest of personal safety and protecting the value of what is likely their biggest financial asset, prospective buyers and investors should be aware of any natural disaster risk impacting a potential home purchase,” said Daren Blomquist, vice president at RealtyTrac. “There is no reason homebuyers need to be surprised with natural disaster risk information when wading through a stack of disclosures at the closing table given the widespread availability of this data online and even through mobile apps. “In most cases learning about natural disaster risk will not stop a home sale, but it will help buyers make a better-informed decision about where to buy and also be prepared in terms of appropriate insurance coverage and family contingency plans depending on the type of natural disaster risks most affecting the home they end up purchasing,” Blomquist added. States with the most homes in High risk or Very High risk counties for overall natural disaster risk are California (8.4 million), Florida (6.7 million), New York (2.4 million), New Jersey (2.3 million) and North Carolina (2.3 million). Metro areas with the most homes in High risk or Very High risk counties for overall natural disaster risk are New York (3.5 million), Los Angeles (2.5 million), Miami (1.9 million), Houston (1.2 million), and Riverside-San Bernardino in Southern California (1.1 million). The report found that 24.5 million single family homes and condos (29 percent of the 83.4 million total) with a combined estimated market value of $4.7 trillion are in counties with a High risk or Very High risk for hurricanes. 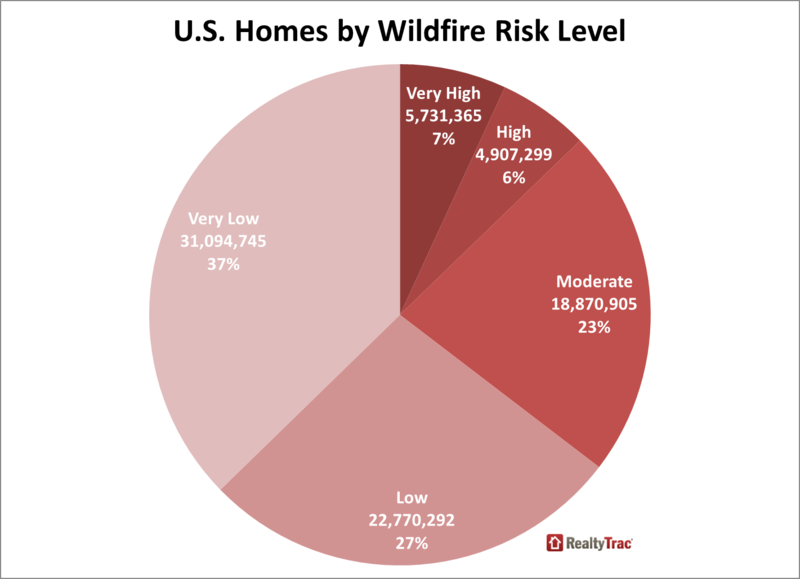 The report found that 10.6 million single family homes and condos (13 percent of the 83.4 million total) with a combined estimated market value of $1.8 trillion are in counties with a High Risk or Very High risk for wildfires. Metro areas with the most homes in High risk or Very High risk counties for wildfires are New York (2.1 million), Riverside-San Bernardino in Southern California (1.1 million), Charlotte, North Carolina (471,905), Columbia, South Carolina (252,155), and Charleston, South Carolina (214,666). Homes in Very High risk counties for overall natural disaster risk had an average estimated market value of $170,237, and homes in High risk counties had an average estimated market value of $191,244. Meanwhile the average home value in Very Low risk counties was $151,793, and the average home value in Low risk counties was $154,464. Although average home values were higher in higher-risk counties, home price appreciation over the past 10 years was stronger in lower-risk counties. Among 551 counties with sufficient historical home price data, home sales prices in counties with a Low risk for natural disasters increased 6.6 percent on average between 2005 and 2015, and home sales prices in counties with a Very Low risk for natural disasters rose 9.5 percent on average during the same time period. Conversely, home sales prices in counties with a High risk for natural disasters decreased 2.5 percent on average over the past 10 years while home sales prices in counties with a Very High risk for natural disasters decreased 6.4 percent on average. 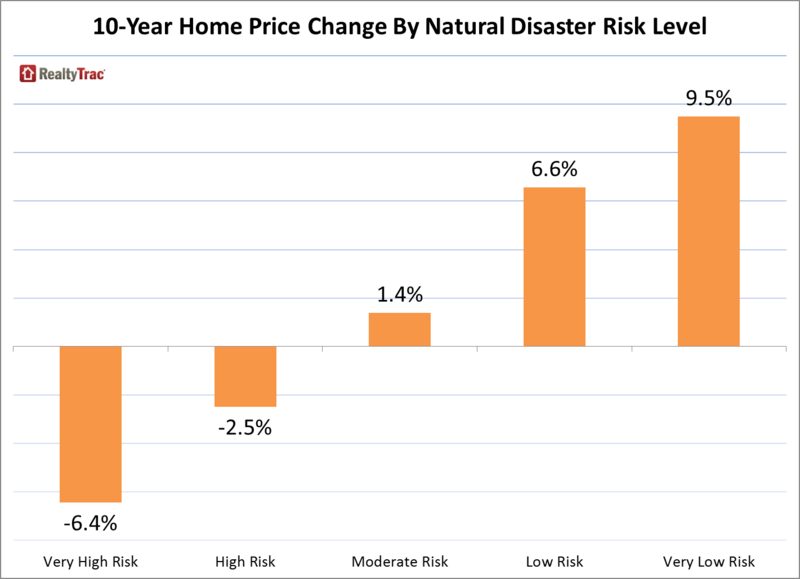 Home price appreciation over the past three years has been stronger in higher risk counties for natural disaster. In counties with a High risk for overall natural disaster, home prices increased 16.6 percent between 2012 and 2015 on average, while home prices in counties with a Very High risk for natural disasters increased 20.4 percent during the same time period. Home prices in Low risk counties increased an average of 10.1 percent over the past three years, and home prices in Very Low risk counties increased an average of 12.8 percent during the same time period. In its second annual U.S. Natural Disaster Housing Risk Report, RealtyTrac analyzed five different natural disasters posing a risk to housing: earthquake risk, hurricane risk, tornado risk, flood risk and wildfire risk. Based on these five factors, each of the counties analyzed was assigned a combined natural disaster risk score from 0 to 300, with 300 representing the most risk (190 was the highest score among all the counties). 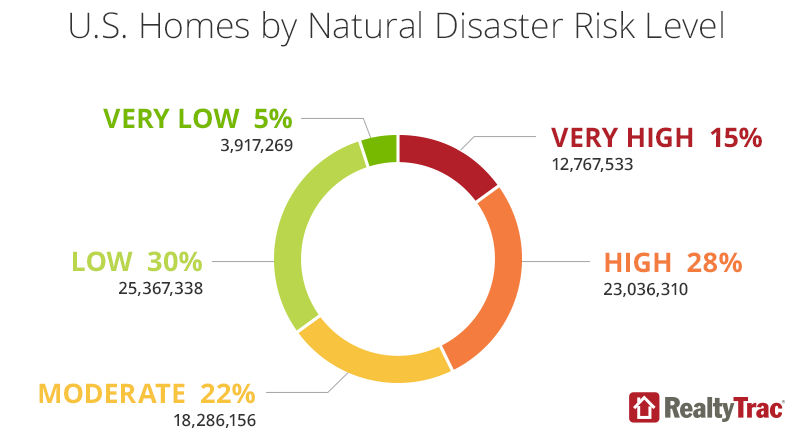 Based on these scores, counties were assigned one of five different categories of risk of natural disaster: Very High Risk (Score of 90 or higher); High Risk (55 to 89 score); Moderate Risk (30 to 54 score); Low (15 to 29 score); and Very Low (0 to 14 score). The earthquake risk score is based on a predictive earthquake risk model created by the U.S. Geological Survey (USGS) that calculates the probability of a 5.0 magnitude earthquake occurring within a 30-mile radius over the next 50 years. The hurricane risk score is based on historical hurricane activity data from 2001 to 2013 from the National Oceanic and Atmospheric Administration (NOAA) that ranks hurricane risk in each county on a scale from 0 to 456,668. The tornado risk score is also derived from NOAA data from 2001 to 2013 that provides a Destruction Potential Index (DPI) for each county based on the number of tornados, path area of tornados in square miles and intensity of tornados using the Fujita scale of F0 to F5. The flood risk score is based on flood zones defined by the Federal Emergency Management Agency. For this report, RealtyTrac analyzed the percentage of single family homes in each county that are in flood zones considered high risk by FEMA (A, A99, AE, AH, AO, V, and VE). The wildfire risk is based on categories of Wildfire Disaster Potential (WHP) developed by the USDA Forest Service and Fire Modeling Institute. For this report, RealtyTrac analyzed the percentage of property parcels that are in areas defined as having “Very High” or “High” WHP. The 551 counties analyzed for 10-year and three-year home price appreciation only included counties with at least 10,000 single family homes and condos and excluded counties where historic home price data was insufficient. Everyone loves what you guys are up too. This type of clever work and reporting! Keep up the terrific works guys I’ve incorporated you guys to our blogroll.